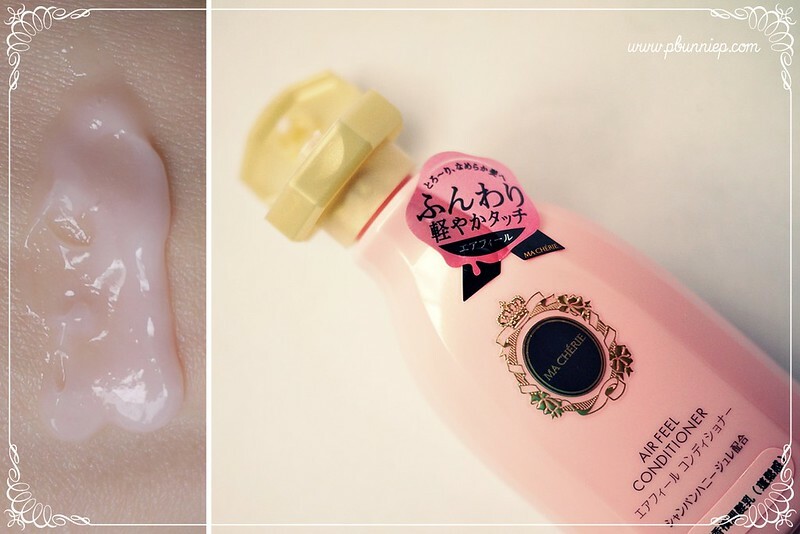 Today's post brings one of my favourite products from the past month, it's from Shiseido and it's a hairline set. Sounds odd? Truth is, in Asia big companies like Shiseido also produce smaller brands ranging in a variety of products so even if you're not a big spender, there are still many options to explore. North American releases of Shiseido products are rather safe and predictable but their Asian market is so much more fun! 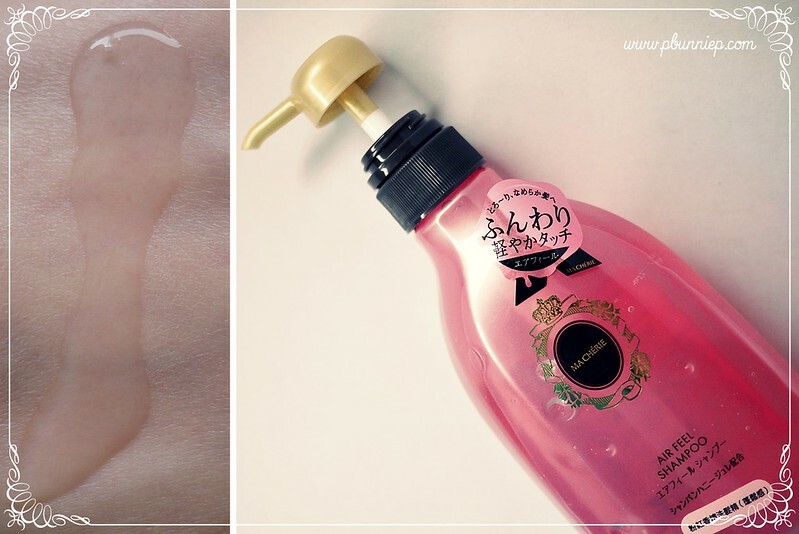 You may remember appearances from these pretty little bottles from a previous SaSa video, I had originally purchased the conditioner alone but later on found the large sized shampoo in a local Asian beauty shop and decided to complete my duo. Admittedly, the princess allure of the packaging did have a little something to do with my purchasing decision but none the less I have heard many things about this Shiseido sub range. The Ma Cherie line features two main shampoo/conditioner duos, aptly named Moisture (for dry hair) and Air Feel (for oily hair or those seeking volume). 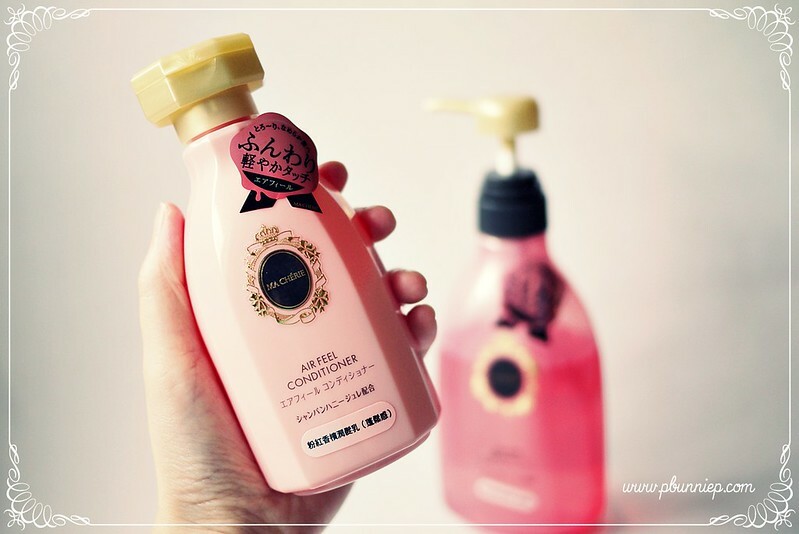 Ma Cherie's Air Feel shampoo is quite a heady peach infused experience (the watery juicy variety). Coming out a clear pink liquid this does lather up to a fluffy head of bubbles and is very refreshing on the scalp. Doing as I usually do, a double washing with this shampoo left my hair smooth and comfortable, not overly stripped but not a smudge of residue either. I then coat the lower 2/3rds of my hair with the corresponding Ma Cherie Air Feel conditioner which is quite thin and lightweight, so much so that it seemed like my hair just drank it right up instantly and disappeared. When it came time to wash again, there was little to be rinsed off. My hair wasn't overly siliconed and slippery as it can be with certain heavy conditioners but it did feel natural smooth. The results of this princess hair experience? This combination fluffed up my wispy layers with airy volume and added movement without causing frizz. I especially loved how my hair always came out refreshed but not overly dry, the perfect balance for my current virgin hair situation. The Joico K-Pak series that I loved so much was just too heavy on a daily basis after I grew out my dye job and this was a much welcomed change that really plays up my current style. The peach scent doesn't last very long which may or may not be a good thing but I personally like something light as I don't like products to clash with my perfume. This also a great range for air drying your hair which I what I do most often now that I'm growing out locks and don't have the time to fuss with them. While this range does claim nourishing ingredients such as honey and champagne, it's not likely to be in concentrations high enough to have a permanent effect the hair. Anyone with dry or highly damaged hair won't find this rich enough for daily use however anyone with long layered hair or fine hair looking for a volumizing haircare set might really fall in love with this. Overall I do really enjoy this for soft, touchable, fluffy girly hair...you know, the type that blows in the breeze in romance movies. You might be able to find these if you have a Japanese or Asian supermarket near you, they often have a beauty/skincare aisle.